1937-43 Credit Manager, Wilson Sporting Goods, Kansas City and St. Louis, Missouri. Played league basketball and softball for Wilson and Gold Bond. 1943-46 Commissioned Ensign, Supply Corps, US Naval Reserve. Attended Harvard University, served at Great Lakes; Walnut Ridge, Arkansas and in Philippine Theater. Released from active duty. 1947-54 Commissioned Lieutenant, Supply Corps, regular Navy. Served in New Orleans; Panama Canal Zone; Point Mugu, California; served as Supply Officer on USS Iowa (BB-61) in Korean Waters and at Naval Air Station, Astoria, Oregon. 1955 Earned Masters in Business Administration from University of Michigan, Ann Arbor -- second in class with 3.91 average. Spent 3 months with General Motors, military intern program. 1956-58 Served as Depot Planning Officer, Naval Supply Depot, Guam. Coached Depot basketball team which won All-Island Championship. Promoted to Commander, Supply Corps in 1958. 1958-61 Served as Contracting Officer for Defense Atomic Support Agency, Washington DC. 1961-63 Served as Supply Officer on USS Jason (AR-8) in Vietnamese Theater. 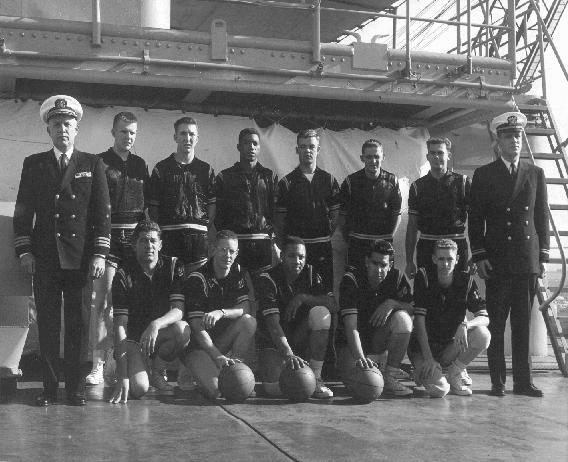 Coached ship's basketball team which, in 1962, won 47 games and lost 1. 1963-66 Served as Director of Purchase Division, Aviation Supply Office, Philadelphia. Promoted to Captain, Supply Corps in 1964. 1966-70 Served as Commander, Defense Contract Administration Services Region, St. Louis. Administered Navy, Army, Air Force and NASA contracts, supervised 1600 civilian and military personnel in 8 state area. Died in Tucson, Arizona March 5, 1987. Buried in Miami Cemetery. Where more fish would wish it. In anger or in shame? At both ends are the same. He only has to do it! Is run of the mill. Neither has reason nor has rhyme. Or moving out of one. They will have made great ancestors!